Ford Mustang Forums : Corral.net Mustang Forum > Classifieds > Advertiser's Showcase > For Sale NOS 1987-1993 MUSTANG QUARTER WINDOWS!!! NOS 1987-1993 MUSTANG QUARTER WINDOWS!!! 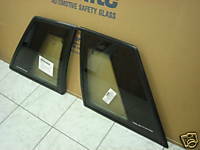 We have a limited quantity of brand new (NOS) coupe and hatchback quarter windows for your 1987-1993 Mustang and Cobra!!! These are genuine Ford Carlite windows with moldings not the aftermarket no-name off-shore produced junk. Remember, only these genuine Ford Carlite windows have the "MUSTANG" lettering like original!!! often as new parts are added daily!!! International orders are always welcome!!! I want a set of these. My windows cant be fixed. Do you still have any coupe quarter windows available? do you still have quarter windows available for a 92 hatchback? I would buy the cobra quarter windows if you still have them. We get NOS coupe and hatchback quarter windows in periodically. Hi there, I am also looking for a NOS pair of 1992 Mustang quarter windows. How can I obtain a set? The site says call. Asking the question here is legit. Would be better to call however.